This dish reflects the purity of the Cantonese approach to cuisine—find the best ingredients and bring out their essential flavour with light cooking. 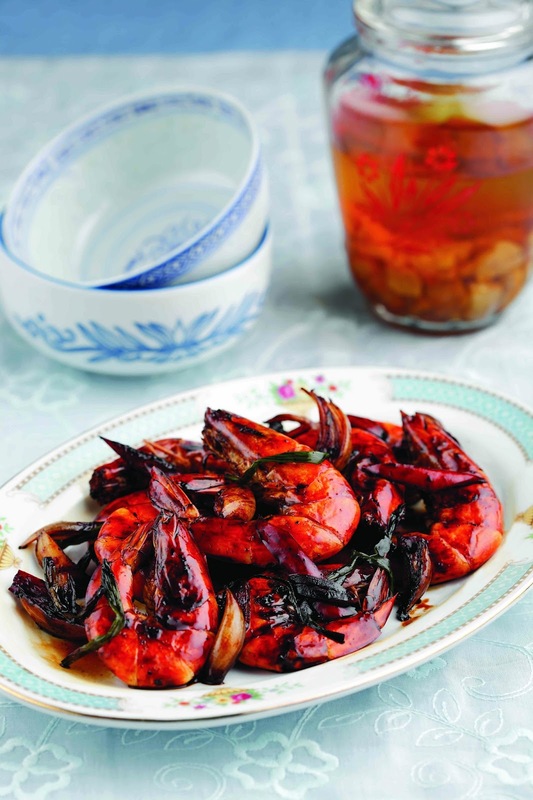 This classic homestyle dish should be made with the freshest prawns (shrimps) you can get; dry-frying them as an initial step turns them deep red and enhances their aroma. Do use lard if you have it available, as it gives the prawns a special fragrance. 1. Wash prawns well. With kitchen scissors, snip off all their legs and trim off the sharp points on their heads. 2. Combine salt with cold water in a bowl and stir to dissolve. Add prawns to bowl, cover and chill for 30 minutes. This step gives the prawns a firmer texture. Just before you start cooking, drain prawns well and pat dry with paper towels. 3. Heat a well-seasoned wok over medium-high heat. Place prawns in wok, spacing them out evenly. Let fry undisturbed for 45–60 seconds, then flip over each prawn and fry for 45 seconds more. Prawns will be nearly cooked through and browned at the edges. Transfer prawns to a plate. 4. Add lard or oil and sugar to the wok and let sugar melt and caramelise to a pale brown, stirring once or twice. This will only take a few seconds. 5. Add spring onion, ginger, chilli and onion to wok and stir-fry for 30 seconds. Add prawns and stir-fry for 30 seconds more. Add dark soy sauce and sesame oil and fry briskly for 20 seconds, until prawns are well coated with the sauce. 6. Drizzle in rice wine around the edge of the wok, fry for a final 5 seconds and dish up. Serve immediately.